CLOSED 1-6 Florida/Alabama Blog - January Thaw! Re: CLOSED 1-6 Florida/Alabama Blog - January Thaw! I'm wondering..what will be the temps up by Aug,Jenny and WD,john if My temps turn out to be 20's down here?...local met is saying there IS the possibility temps could go lower in places....and strong winds..so wind chills will be bad too thru the night and tomorrow morning..stay war folks. EST Thursday. The Hard Freeze Watch is no longer in effect. * TEMPERATURE...mid to upper 20s. are expected for at least 2 hours. 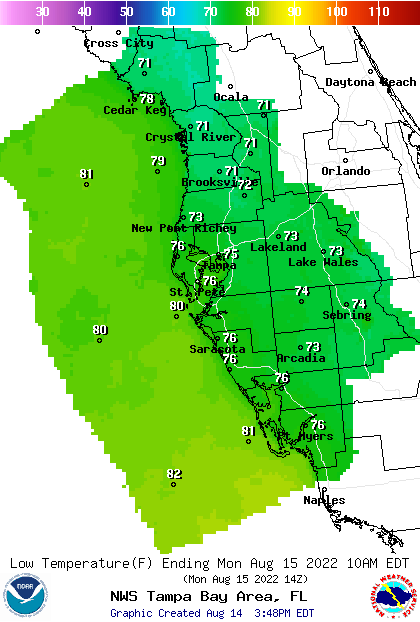 yeah its going to be cold alright tonight,hope those numbers verify for our area st pete. building waves and strong north winds. Mikes thoughts...Snow and Ice have reached the Gulf once again. 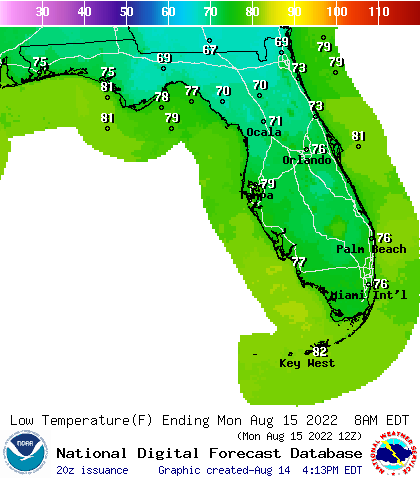 The question for tonight is how low will the cold go in Floriida. well we'll see how this plays out overnight,just hope no really strong winds etc. gee I hope this verifies st pete.. It was a cold 34 this morning. My work assignment required me to drive the boat from Cedar Key to Horseshoe Beach and back. It was cold, cloudy and raw That was the coldest I have been on the water in several years. I got back to Cedar Key at noon and I am just now starting to thaw out. Looks like lower 20's tonight with wind chills in the mid teens. Fun times. We will all be stripping down to bathing suits when it hits 70 this weekend. waterdipper wrote: It was a cold 34 this morning. My work assignment required me to drive the boat from Cedar Key to Horseshoe Beach and back. It was cold, cloudy and raw That was the coldest I have been on the water in several years. I got back to Cedar Key at noon and I am just now starting to thaw out. Looks like lower 20's tonight with wind chills in the mid teens. Fun times. We will all be stripping down to bathing suits when it hits 70 this weekend. good thing you got back safely WD,winds here picking up now,gusting over 20mph...guess the front is getting closer now..solid overcast and the breeze is cold.. I guess Billsfan's area might go into the 40's..that temp is cold for that area,been warm down there. st pete..its down to 46 here by me and winds pretty strong too. JOHN..Hard freeze warning for your area..good luck tonight.....................NWS Tampa..
another freeze and very low wind chills tonight into Thursday. * IMPACTS...Unprotected plants may not survive. the next few hours as the 12z models begin to arrive. Southwest Florida and portions of Palm Beach and Broward Counties. been transmitted with these changes. it seems all roads in Alabama are closed-deemed impassable...ice and snow drifts etc..must be a lot of accidents too huh..Houston yesterday reported over 400 accidents on the roadways..you have to watch that ice on the roads folks..very dangerous even if your careful. ok BBL..things to do outside before the freeze comes. Oooh Waterdipper, I would NOT have wanted to be you today. Dad does the manatee count on a pontoon and kayaks at the wildlife park in Homosassa and I'm sure his buddies will be freezing their hiney's off tomorrow and Friday morning. Hi everyone! Oh my is it ever going to be cold for you all. Me too, but not as cold as you all. This winter has been crazy, cold and wet. We're certainly going to pay for this down the road lol. And yikes WD your trip sounds miserable! Temp has dropped 16° since noon. Getting breezy too. Might throw some wood in the fireplace tonight, 2nd time in 6 years! Stay warm St Pete and all! I haven't worn flip flops in weeks! I've got a pot of chili cooking on the stove for tomorrow. I think it's a record short time period between pots of chili! I usually only make it 2-3 times per year. across portions of the Nature Coast and down to the I-4 corridor. * TEMPERATURE...28 to 32 degrees. * DURATION...2 to 5 hours. damaged or killed. Remember to bring pets indoors. good Thursday Morning folks! !..well down to 28 here by me now..might drop some more as dawn approaches....cold day ahead and NWS is saying tonight and tomorrow morning the same..bundle up when going outside...man its a good thing I covered things up outside yesterday.....well have a great day everyone! Got down to 24.3 with a wind chill of 17.4 this am. I think it will get colder tonight. Good morning from frozen Levy county. It got down to 20 at my place this morning and the sky was a beautiful pink at sunrise due to the early morning light filtering through the icy cold air. Super dry here as well with no frost at all. My secretary lives a mile from me on an open scrub hill and she has two thermometers that both said 16!!! Too cold for north central FL. I agree it just might get colder tonight with perfect radiational cooling conditions forecast. NWS even mentions guidance coming in several degrees colder for tonight and now have a hard freeze for all north central FL. It has been a few years since I have seen teens at my place, but we might do it tonight. BillsfaninSoFla wrote: I've got a pot of chili cooking on the stove for tomorrow. I think it's a record short time period between pots of chili! I usually only make it 2-3 times per year. We eat chili almost once a week during the winter months as my kids love it and it really helps warm you up. I am not a big soup or stew eater most of the time, but when we do have a cold winter I really enjoy them. Yesterday my wife my a big pot of ham and bean soup she made from the ham bone left over from Thanksgiving. It was delicious and really helped warmed me up after my cold boat ride. It is colder in north Florida right now than in northern Minnesota. Not too bad here in St. Pete. My thermometer said 31° this morning but no ice anywhere, and its already up to 40. I was surprised it got down to 26.5 here, it will be interesting to see what tonight's low temps reach. I am up to 30.3 currently. And yep, the fire is burning! yeah its cold here..24 right now and the winds starting..wind chill will get all those walking without that head covers..whew its cold!! Just pulled above freezing here. Got down to 27. No frost (wind and low humidity), but plenty cold. My forecast for tomorrow says upper 30's. Chili is a staple here. I cook up about a large pot every other month or so, and freeze a dozen portions for my lunch rotation. Holiday leftovers provided turkey soup, split-pea soup, and beans&ham. Got chili-mac on deck for this weekend. JRnOldsmar wrote: Just pulled above freezing here. Got down to 27. No frost (wind and low humidity), but plenty cold. My forecast for tomorrow says upper 30's. yes just went up to 32 here by me,a heat wave lol...man its cold. OMG so many without power in this COLD.........................More than 5,000 Duke Energy customers were without power at one point Thursday morning, and 4,000 were still without power at 10:30 a.m. Launch tonight -- window = 7:52pm + 40 minutes. I'm pretty sure it will be a mostly clear night. Oh, and I'm up to a balmy 43.7. Not close to the forecast high so curious what happens tonight. I see they have expanded the hard freeze and freeze warnings again. My updated low is now 30 for tonight. JRnOldsmar wrote: Launch tonight -- window = 7:52pm + 40 minutes. I'm pretty sure it will be a mostly clear night. Don't they sometimes postpone launch due to cold temperatures? Good afternoon. Looks like it was a BRRRR day for many! 25 here overnight/early morning. Ran an errand at 1pm and it was only 46 under full sunshine. Upper 20's forecast tonight then onward and upward to more normal temps. Well, so much for that idea. Just checked my NWS JAX forecast. Another night of 25 then up to 37 tomorrow night. Will monitor if that trends downward and whether or not a few plants will need cover again. StAugustineFL wrote: Well, so much for that idea. Just checked my NWS JAX forecast. Another night of 25 then up to 37 tomorrow night. Will monitor if that trends downward and whether or not a few plants will need cover again. yeah another night of freezing temps for a lot of area's..funny thing,no freeze warning for my area..we'll see if that verifies..this cold front is fooling the "experts". below for several hours across the warned area. to 9 AM EST Friday. The Freeze Watch is no longer in effect. BETWEEN 27 AND 32 OVER A WIDESPREAD AREA. PLANTS...AND BRING PETS INDOORS THIS EVENING.